Ships today if you order in the next 11 hours 6 minutes. Auto Ship & Earn + 158 Points What's this? Proper digestion is vitally important to optimal health. Everything we consume must go through this process in order for us to benefit from the nutrients. A number of factors can adversely affect digestion, including stress from our emotions (anger, worry, anxiety), our environment (chemicals) and our dietary choices (commercial, processed food). 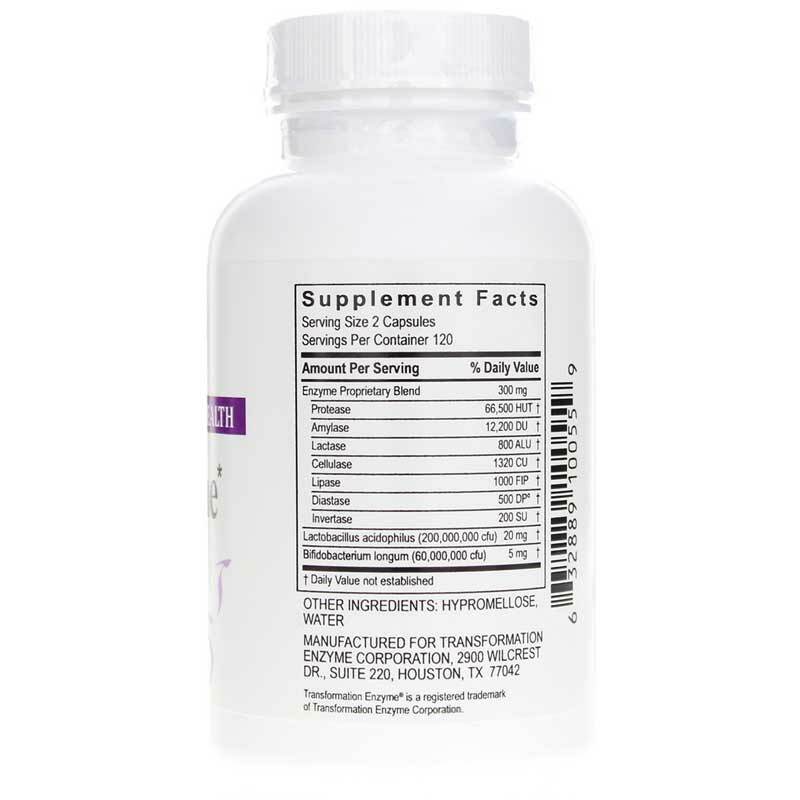 Transformation offers a natural digestive enzyme supplement called DigestZyme that is designed to assist the body in maximum digestion of nutrients, energy production and immune system support. This formula may be useful for people who have a sensitive gut and are experiencing nausea, diarrhea or gallbladder issues. Transformation formulas are known for being carefully prepared to assure maximum quality and nutritional effectiveness. 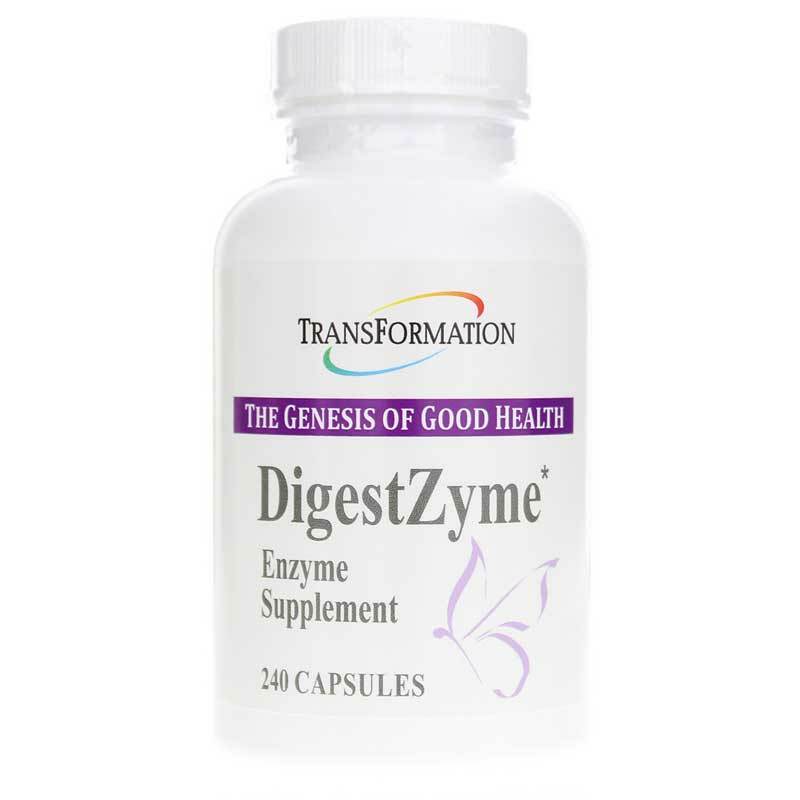 If you're looking for a digestive enzyme supplement that assists the body in maximum digestion of nutrients, energy production and immune system support, check into DigestZyme by Transformation. Order online today! Other Ingredients: cellulose and water. Enzyme activity is measured in Food Chemical Codex (FCC) units. Adults: Take 2 capsules with every meal or as recommended by a healthcare professional. Take with adequate liquid. Vegetable two-piece capsules may be pulled apart and ingredients mixed with food. In cases of Gastritis (extreme case), Gastric Ulcers, or Duodenal Ulcers, use GastroZyme with meals and/or as needed. 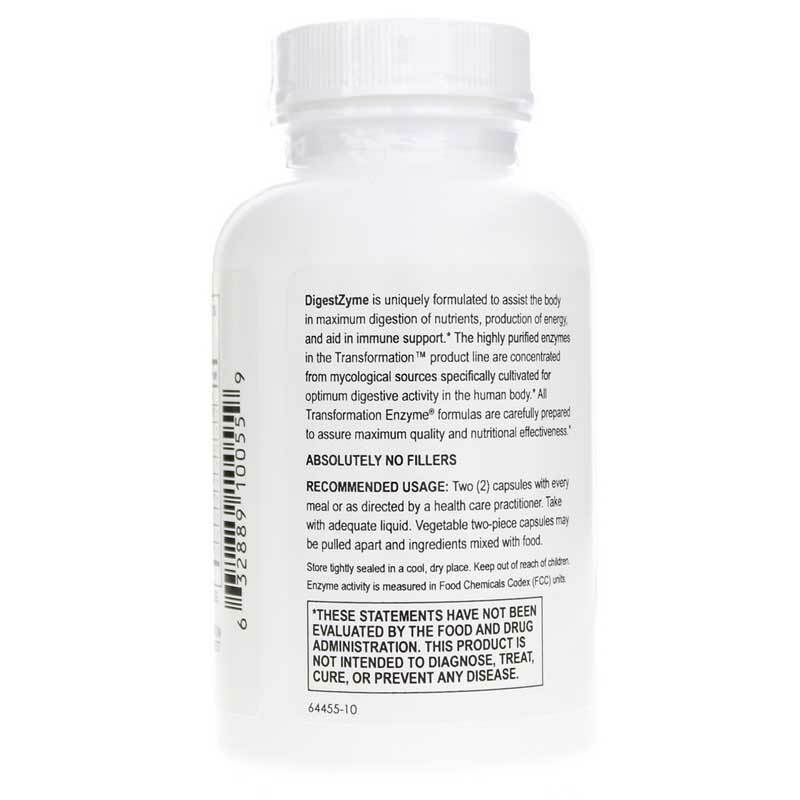 Although DigestZyme is available in a powdered form, the capsules can also be pulled apart and may then be used for children, pets, or in cases where a person is unable to swallow capsules. Powdered DigestZyme should be mixed with acceptable food in a teaspoon for a child or with baby formula in a spoon feeder for a baby. Do not add DigestZyme to a bottle of baby formula or to a bowl of food, since it will automatically digest the food in that container. Keep out of the reach of children. This product works very well to break down the food we eat. When I take the enzymes, my food seems to digest faster and smoothly. This is a wonderful digestive enzyme. My naturopath recommended it to me, so I take it with every meal. My naturopath recommended these, and I have found them to be extremely helpful. I take one or two with meals. DigestZymes are great enzymes..... really helps! These are the best enzymes! I love DigestZyme digestive enzymes. I have been taking them every day for the last 14 years, and I will always be taking them. Good products & service. Review email system flawed. Your products are what we are used to purchasing, and they arrive in a very reasonable time and are well packaged. Thank you for being contentious. Ive been ordering products from NATURAL HEALTHY for close to three years. Ive been completely satisfied with the quality and effectiveness of every item and the speed in which I receive the order. Ive only used customer service once, but my issue was resolved quickly and to my total satisfaction. A great company delivering great products. They have my full confidence in safety, effectiveness and value. All the products we order are great & your service is excellent. Only the email-review never works. Sales person was efficient. Orders are shipped quickly. A good company to deal with. Very good product would recommend it to any one.